I recently took part in an iron-chef-inspired competition at my College. We had to come up with a healthy, tasty, and nutritionally well-rounded meal. As part of that meal, my team created a deliciously fresh, healthy, slightly spicy mango avocado salsa. Well, I use the phrase ‘my team’ loosely. Really it was my (pregnant and very hungry) team mate Sarah Pesses who came up with it, so all the credit goes to her. But I am sharing it here with you because it is incredibly tasty and extremely versatile. We put a dollop on top of our fish tacos, but you could use it as a dip for chips, on top of veggie fajitas, grilled chicken, or even in a salad. And if you want to feed it to your children, you could simply omit the cayenne pepper. The great thing about this salsa, besides the fact that it only takes about 10 minutes to make, is that it is chock full of wonderful vitamins, minerals, and phytonutrients. 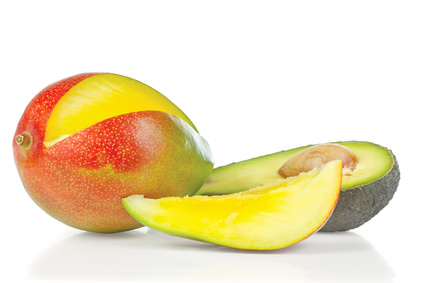 Mango is a good source of fiber and a very good source of vitamins A and C. Avocado is also a good source of fiber, with one half of a California avocado containing 20% of your daily fiber needs. It also contains plenty of monounsaturated fats (the healthy ones). And as for the cilantro and lime juice, cilantro adds a whole host of vitamins and minerals to this dish too numerous to mention, and lime is an excellent source of vitamin C. So you can enjoy this healthy snack, condiment, or salad safe in the knowledge that you are doing some good for your body. 1. Dice the avocado and mango and put them together in a bowl. 2. Finely chop the cilantro and add it to the bowl with the lime juice, cayenne pepper and salt. 3. Mix all ingredients, serve, and enjoy.